These percentages will continue to rise during the first 24 hours! Daniel Teague, based in Phoenix AZ, was introduced to me by his aunt, a friend and colleague, as a person with remarkable talents that include long distance Chakra alignment, house clearing (of negative energy) and the cutting of energetic cords. Since she is an extreme skeptic with regard to all things metaphysical, I was intrigued when she assured me that his abilities were real…that she’d experienced them firsthand. Another of my colleagues is an amazing naturopathic doctor who works with HRV (Heart Rate Variability) equipment. On Wednesday, February 24, at 12:30 pm the technician and I took an HRV baseline reading of my entire system then called Daniel via cell phone. 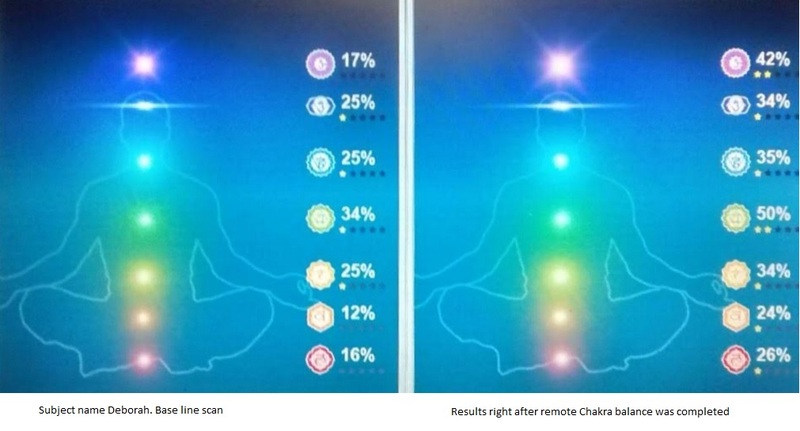 Within 2 -3 minutes he adjusted my chakras…from 2,300 miles away! (I’m based in Pennsylvania, by the way). The post-adjustment HRV scan showed marked improvement in my chi (life force energy), meridians as well as in each of my chakras.